This is not simply too much space, you are missing Levels and White Balance. It's not a new bug either, I reported it in December 2017. Levels and White Balance should be missing. I can repo this every time now. I'll update the developers. > 4. Levels and White Balance should be missing. Please edit: should _not_ be missing. The shouldn't be missing,no. I was saying that if you follow the above recipe in this current build, this is what you should see. Even though it is wrong. It's good to know you can now reproduce this. Surprising more people haven't reported from the first time @manu schwendener wrote about it. Didn't realize it was missing a few of the adjustment options. I have to wonder what percentage of people actually use the Adjustment studio? Just curious... 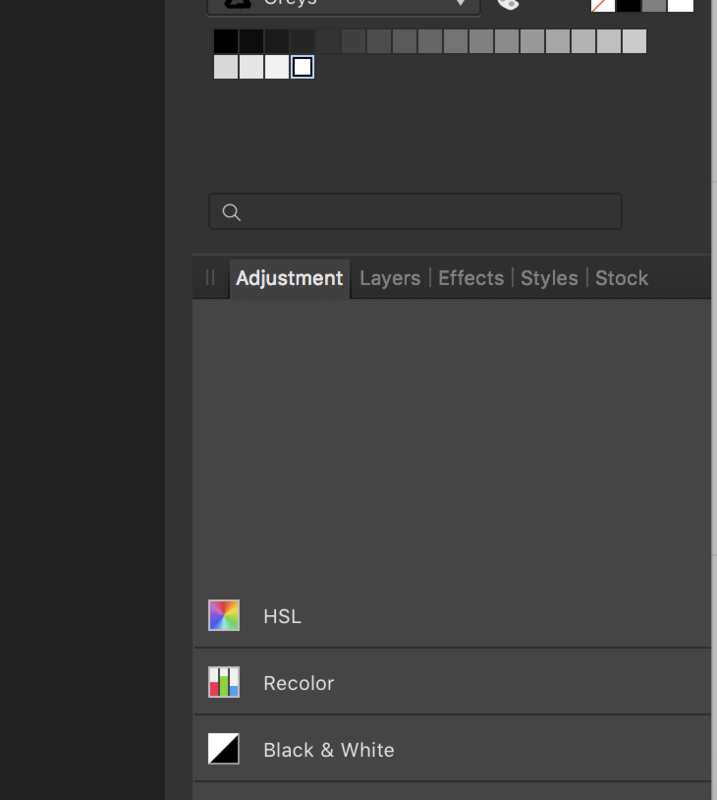 I almost never use that, I just add the layers using the menu on the Layers studio when I want them. Not everybody works with layers. I use Affinity Photo for relatively basic post processing, mainly cropping and some tweaking of Levels and Contrast. If it requires undocking and then redocking that panel I'm not at all surprised more people haven't hit it. Most probably leave it docked. That's just how he could reproduce it. All I do is use the adjustment tools and sometimes the display gets messed up and some times it doesn't (I never undock). Yes, I rarely undock the panel as well. Undocking wasn't the problem the last time this showed up. The adjustment panel allows you to make large incremental changes before getting in the fine tuning which is nice when photos are often far off. As far as I can tell, the adjustment panel creates adjustment layers and offers presets for those layers. The presets are the only functional provision they offer that is not directly accessible from the Layers studio panel. I actually closed mine because I don't really use the presets and see the panel as a waste of screen real-estate, though I can definitely understand that some people would benefit from the presets as a starting point. It doesn't take up any more space really, just makes the words a bit more compact. But then I don't usually work from a small screen if I can help it. - Each has an icon to easily and quickly see what it does. - They don't have to be hidden under a drop down menu. - They don't have to be partially hidden where you are forced to scroll down the list. - You can drag the panel out so it is visual all the time. Especially useful on larger screens. - You can see both the layers panel and adjustment panel at the same time rather than one covering the other up. - And like you said they have presets. Someone else can probably find even more differences. Those are practical / ease-of-use features, not really functional ones (other than the presets). I do most of these types of basic "global" adjustments in the software which I use to catalog my photos (and develop the RAW files) so I have less need for them in Affinity Photo than would someone who is doing the entire process in Photo, and the screen real-estate that it takes up in Photo I would rather use for other things. 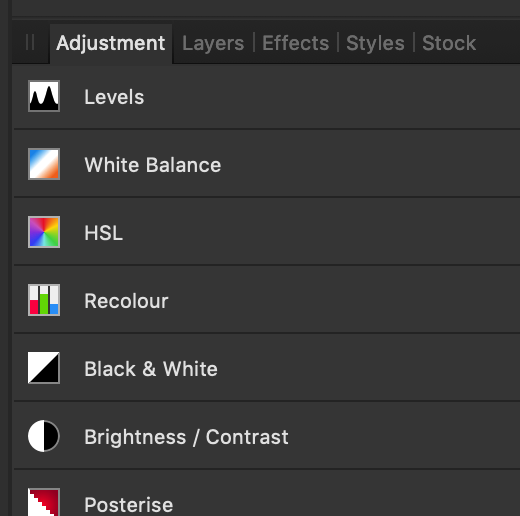 While I do like having access to the adjustment layers when I need them, the popup menu in the layers palette is sufficient for my purposes. 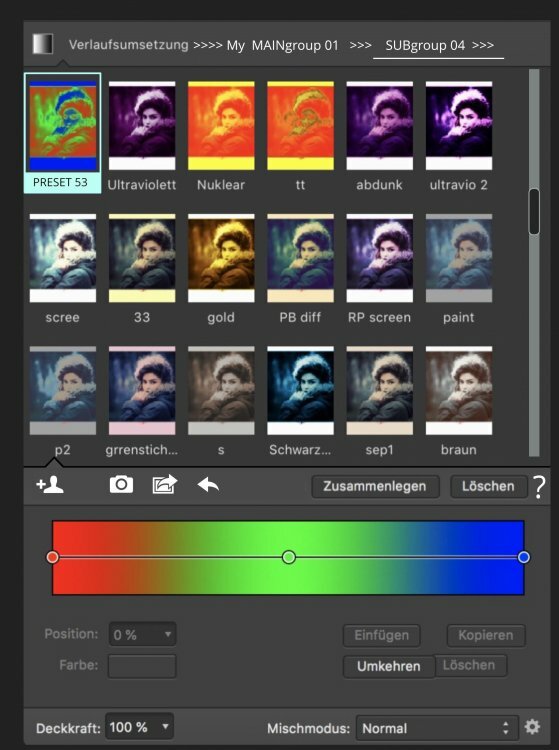 If you are doing the entire process in Affinity Photo then that is a somewhat different story (it is a bug regardless, and fixing all bugs should always take priority over adding any new features to anything, I was just curious as to how many people actually made heavy use of this panel - obviously there are some who do; it doesn't really help me much because of how I work with my photos). A better way would be: As often THIS adjustment (or filter) is selected, the normal box of it is shown. BUT you can now surf trough ALL avaible prestes by just click the first symbol (only for this instances -> if you have eg. 7 levels... there is no confusing...just the current one will affected...)!!!! 6. If you click the upper line with the names... a presest editor will open, where you can reorder/rename/regroup... batch-delete/move(import/export)...SMART-Folder... whatever you know from finder/explorer, but with the filter of just the current tool-presets. OF COURSE THE SYMBOLS /THE TRANSLATION ARE JUST ROUGH SUGGESTIONS... THAT COULD BE BETTER... but the idea/concept should be so or better become real! BTW: The translation "LÖSCHEN" is very confusing in this case. What this "delete" does is "close the adjustment, DELETE this layer!" But it never DELETE a preset or something other. It just "DELETES" itself (its layer). A better (meaning) translation would be "ENTFERNEN" (or short "Entf. "), or (if not so correct, but better meaning) just SUICIDE (Selbstmord), delete me, x-me, trash-me, kill-me, x-z... or löschmich"!